The Mactaquac Dam, located nineteen kilometres upstream from Fredericton, is one of three large hydro-electric dams found on New Brunswick’s Saint John River—there are many more found on the river’s tributaries. This dam, which produces twelve per cent of the province’s electricity, was completed in 1968 and created a reservoir ninety-six kilometres long. Known locally as the headpond, this body of water has become a dominant feature in the landscape of the area over the past fifty years. But unlike a naturally occurring body of water, this lake-like feature is dependent on the dam for its existence. The Mactaquac Dam, like all large infrastructure projects, has a projected lifespan during which it can operate safely. Unfortunately, the concrete used to create the power station of the dam contains an aggregate that expands when exposed to moisture, a condition known as Alkali-Aggregate Reaction (AAR). While mitigation measures have been ongoing since this problem was discovered in the 1970s, the dam will need to be replaced by 2030, thirty years earlier than intended. The province is currently undertaking consultations to investigate options for the future of the dam. The three options involve either the complete removal of the dam and the return of the headpond area to a river valley, rebuilding the power generating station where the concrete affected by AAR is located, or removing the power generating station completely but maintaining an earthen dam, thereby allowing the headpond to remain intact. I first became aware of this consultation process while completing a Master of Resource and Environmental Management at Dalhousie University. I worked with the Energy Transitions In Canada project which conducts research exploring different facets of energy landscapes. The case studies for this project focus on communities with potentially significant changes to their energy landscape in Southern Alberta, Southern Ontario, Peace River (AB/BC), and New Brunswick (the Mactaquac Dam). Geomorphologists and other scientists interested in determining the ongoing environmental impact of a development can monitor changes within these environments over specific periods of time with on-site analytic tools. Less conventional is the attempt to compare conditions from decades ago with those that exist currently. To complete this type of analysis from a hydrologic perspective involves recreating historical stream paths and river watersheds. As I had experience with this process from a previous project, one of my tasks with the Energy in Transition project was to recreate the original Saint John River’s path in order to estimate the area inundated when the Mactaquac Dam became operational. 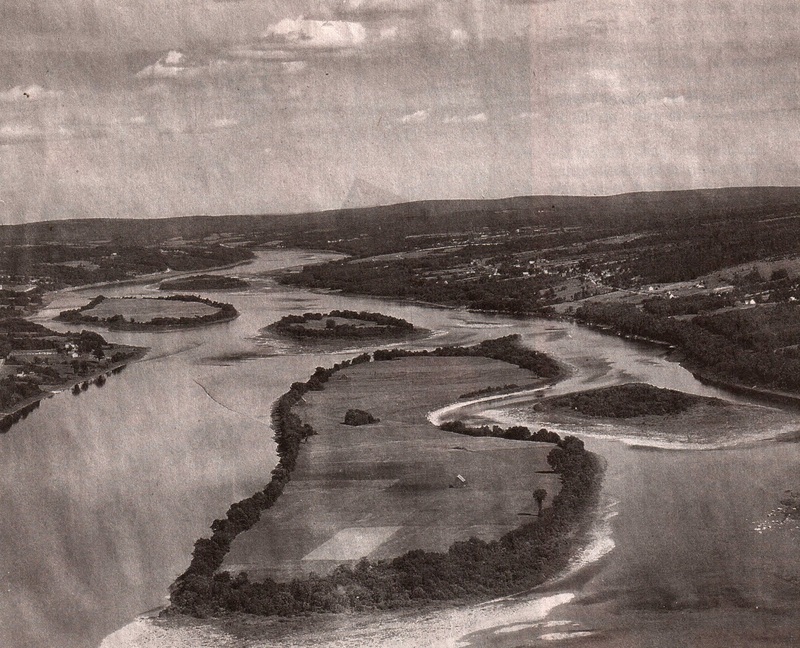 This involved georeferencing just over two dozen aerial photographs taken in the early 1960s of the area upstream of the dam. Once complete, the river and any additional features, such as islands, were drawn in digitally and used for comparison, allowing for a reasonable estimate of the area inundated to be calculated. 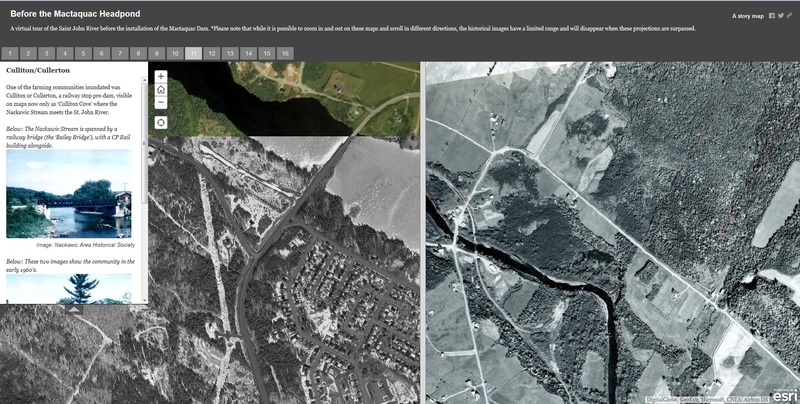 Georeferencing historical photographs requires features recognizable from one period to another. For rural areas or communities that have undergone dramatic transformations, this can be a challenging task. For this project, much of the area being georeferenced had completely disappeared under water. Reference points from the historical photos of farms, schools, church yards, and entire small villages had vanished in the present day view. Communities affected by the flood water removed prepared by clearing the land and removing infrastructure including the Hawkshaw Bridge, located close to Pokiok Falls, which is shown being demolished. This imagery, with its lost communities, is very compelling, and so Dr. Kate Sherren and I began to discuss how they could be used to create a discussion tool. The result is the story map Before the Mactaquac Headpond, an interactive map with a swipe tool that allows viewers to see the lower part of the Mactaquac Headpond (along the pre-dam Saint John River valley) as it was. It has been distributed in the community through the local press and shared with different regional organisations. 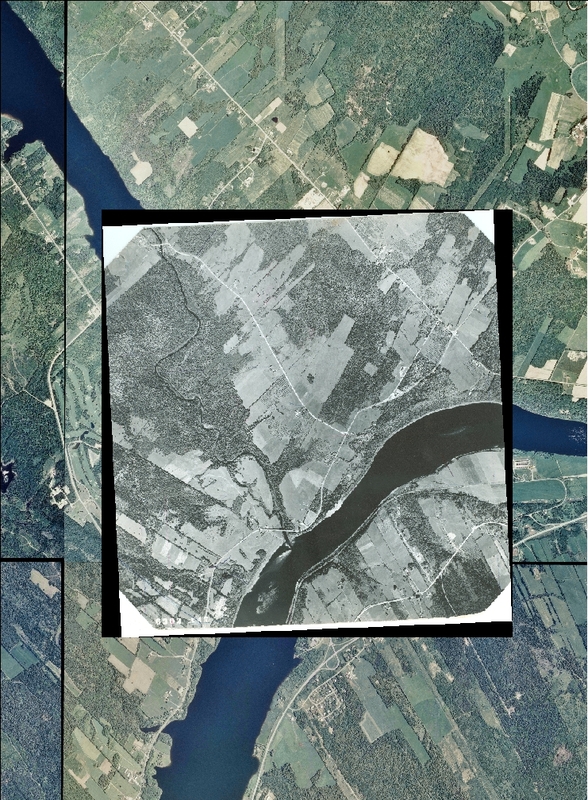 The story map includes photographs of the communities along the river valley as they were and as they prepared for the rising water. 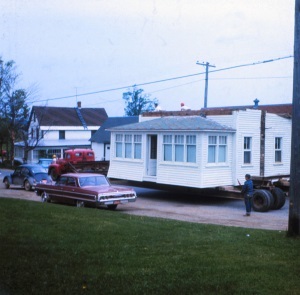 Returning the Saint John River to its former self won’t recreate the communities that were inundated half a century ago, but these images capture a period when local people had an immense change forced upon them. They are especially interesting to consider as NB Power is soliciting opinions about the future of the Mactaquac dam, including its possible removal. As a scientist, my interest in this project began with the profound ecological impact of the dam on the Saint John River. By controlling the flow of water, hydroelectric dams transform rivers in a number of ways. A key characteristic of any river is its flow, which affects the movement of sediment and nutrients within the river and the frequency of flooding. For example, annual flooding of rivers helps to distribute seeds of native species to the banks of rivers. It also triggers anadromous fish—in the Saint John River this includes Atlantic salmon and gaspereau—to migrate downstream to the ocean in the spring. The Mactaquac Dam, like many others in the area, does not have a fish ladder, so returning adult fish are trapped in a fish way and then trucked over the dam and released in the headpond. Even when fish do manage to reach the upper tributaries and spawn, most of the smolts and other young fish do not survive the spring migration; if they do arrive at the dam, the only passage downstream is through the Mactaqauc dam’s turbines, spillways or sluiceway. Additionally, the Mactaquac dam releases water based on the energy demands of the region, resulting in high flow volumes occurring at different times throughout the day, rather than in different seasons, as occurs naturally. Over the past few decades, the negative ecological impact of dams have become better understood. This has led to more comprehensive studies of what dam removal involves and when it might be appropriate. It has also led to a better understanding of what the results of dam removal can be. For example, fish and aquatic species often return to the upstream reaches within days of the removal of a dam; however, newly exposed land can take many years to become rehabilitated. In the case of the Mactaquac Dam, shortnose sturgeon, which, in Canada, is only found in the Saint John River – along with Atlantic salmon and other species – would be able to swim freely to historical habitat and spawning areas should the dam be removed. Encouraging studies of the Mactaquac headpond show that there has been limited deposition of sediment and that the river channel, including the islands, remain present. If the Mataquac dam were to be removed, the proposed draw-down of the dam, or lowering of the water level in the reservoir, would occur slowly over many months, reducing flooding and erosion downstream. While the removal of the dam would restore the river valley, the flow regime would still be controlled by the other two hydro-electric dams on the Saint John River, the Beechwood and Grand Falls Dams. From an ecological position, dam removal is an exciting proposition. But for the people who live around the headpond, the removal of the Mactaquac Dam would dramatically alter the landscape they are now familiar with. It would also leave New Brunswick with the difficult challenge of replacing the power currently generated by the Mactaquac Dam with an alternative source of energy. NB power is expected to make a decision on the future of the Mactaquac dam sometime in 2016 and public comments continue to be accepted until March 31st. Gilks, P., May, T., & Curtis, D. (2001). 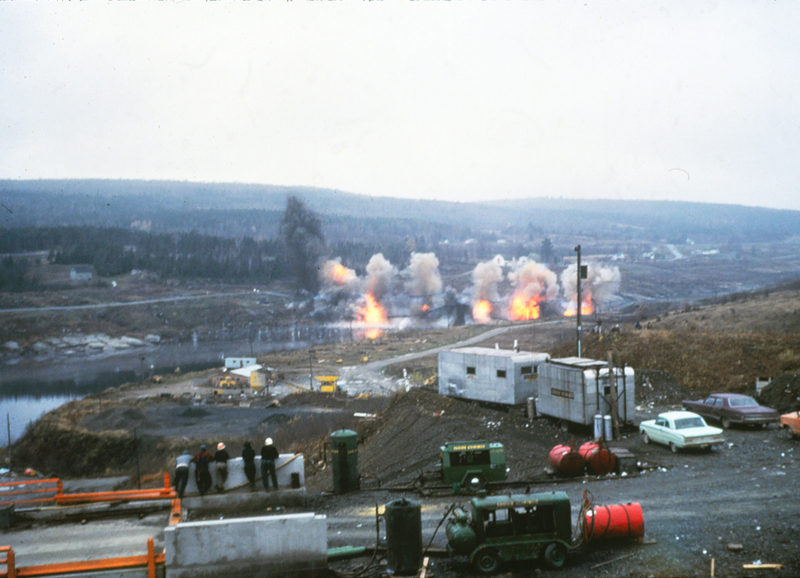 A review and management of AAR at Mactaquac generating station. Canadian Dam Association 2001 Annual Conference, Fredericton, NB, Canada. September 30 –October 4, 2001. La Centrale de Mactaquac Generating Station (n.d.). Kidd, S.D., Curry, R.A., and Munkittrick, K.R. (2011). The Saint John River: A State of the Environment Report. Canadian Rivers Institute, University of New Brunswick. 1-183. Kidd, S.D., Curry, R.A., and Munkittrick, K.R. (2011). Babbit, B. (2002) What Goes Up, May Come Down. BioScience, 52(8), 656-658. Hart, D. D., Johnson, T. E., Bushaw-Newton, K. L., Horwitz, R. J., Bednarek, A. T., Charles, D. F., Kreeger, D. A., and Velinsky, D. J. (2002). Dam Removal: Challenges and Opportunities for Ecological Research and River Restoration. BioScience, 52(8), 669-682. Stantec Consulting Ltd for New Brunswick Power Corporation, September 2015. Larissa is interested in various tools used for decision making processes for natural resources, especially for rivers and watersheds. She has a Master of Resource and Environmental Management from Dalhousie University. The interactive map is a cool way to visualize the inundation. This also brings up some very interesting questions about the ecological impacts of not only building dams, but also of removing them – e.g., to what extent can these waterscapes really return to their former state (e.g., at what point does the headpond start to function ecologically more as a lake and less as a river? Given the spate of (smaller) dam removals that has been happening in the United States, are there studies about how the ecological restoration results have lined up with the initial ecological restoration predictions (granted, the removals might have been too recent to fully know)? I am in favor of dam removal, but sometimes I wonder if we unintentionally exaggerate the ecological benefits of removal – or expect that they will be immediately apparent – the same way society exaggerated the economic benefits of the dams? I am not suggesting that this great post is doing that, but as was pointed out, the flow rates will remain controlled by upstream dams and – aside of fish passage issues – the constriction of natural flow regimes seems like it is often what environmentally detrimental. At any rate, this is a very interesting issue and conversation.